We at Rogue Fabrication work hard to provide our customers with the most complete and accurate tube bending information available. We do out part to ensure that your fab shop runs as smoothly as possible. 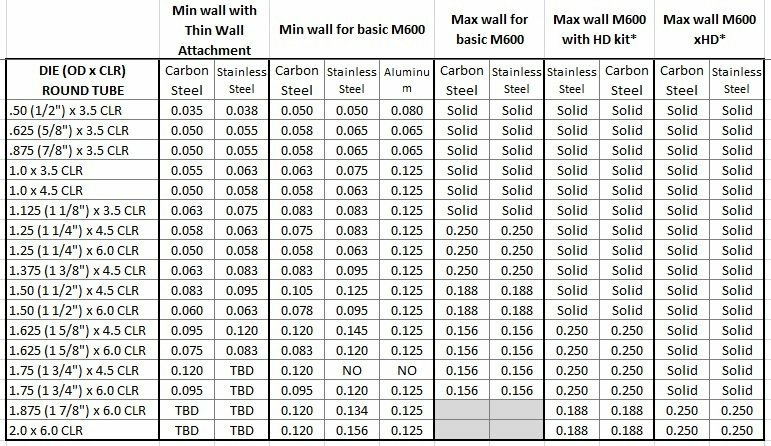 Although the chart below is the result of tests we performed on purchased materials, we cannot guarantee that you will achieve the same results due to the wide variation in material quality from one mill to another. If you want to know what to expect from a specific material, we offer bending diagnostic services. If your bender does not perform to the limits shown in this chart, please call so we can help diagnose the problem. The culprit is usually setup, material quality, or lubrication. If so, the fix is easy. *Assumes two pressure dies are used as per the operating instructions. While making S-bends, however, two pressure dies cannot be used. Thus, the capacity in this column is invalid for making S-bends. Note: The thinner the material, the more potential deformation there will be when using any given die. To avoid flattening on the outside of the bend, either (1) bend on a larger CLR or (2) use material with a greater wall thickness. *HD/xHD – Assumes two pressure dies are in use as per the machine’s operating instructions. Center line radius. See M600 Bender Tech for more info. We test primarily 6061-T6 because if that will bend, most other aluminum alloys will bend fine. We test 1020 DOM and 4130N DOM primarily. We have found that good quality HREW bends the same, but there are many more alloys/grades of HREW, so it can be a source of inconsistency. We only test low carbon 304, 304L. Standard Model 600 bender, no TWA (thin wall attachment). Model 600 HD, or a Standard M600 with HD kit ($65) added, and 2 pressure dies. See “HD Kit” in the dies section for more information. Xtreme heavy duty Model 600 (thicker frame and pins). Drop in subframe that allows ultra fine tuning of bend characteristics. As of 10-5-2016 this option is not yet for sale on our web page. Call us to get on the waiting list. This IS 100% compatible with all current M600 machines. Nominal Pipe Size – for more info on pipe and tube, see M600 Bender Tech. Pipe schedule. This is how pipe thickness is specified. Search online and you will find a pipe schedule with decimal thicknesses listed. To Be Determined. As a small company that is rapidly expanding our product offerings and innovating in affordable metalworking technology, we frequently offer products before we have the chance to find their limit in all material sizes. That is the case where you see “TBD” on a die listing. 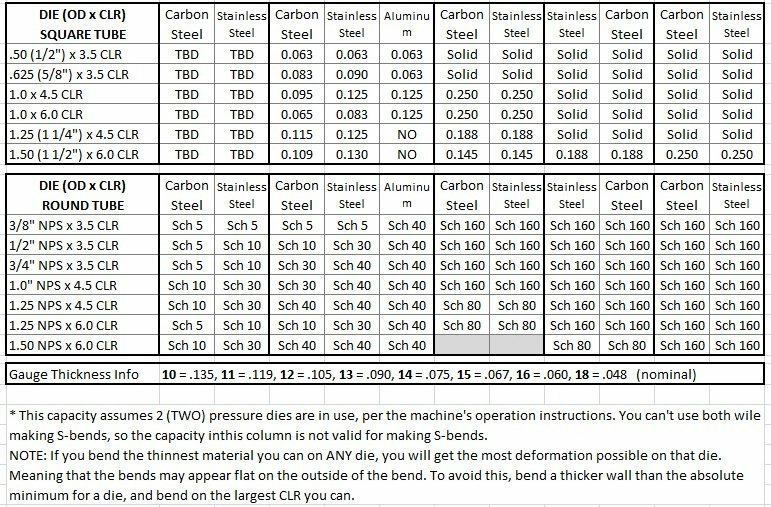 Notes – Bending the absolute minimum that is listed in the table above will produce the highest amount of deformation possible on any given die. Going up even one thickness (like from .095 to .120, or .083 to .095) will typically improve bend quality significantly. We ALWAYS recommend you buy your material from a reputable supplier with material certifications and buy a small amount to test before you order a truckload. If you shop around until you find a better deal than anyone else can get, you are probably buying junk material. Don’t commit to 100 sticks before you test it in a tubing bender! Also, if you want to be 100% certain that your exact material will bend nicely on a die, we are happy to test it for you before you purchase, just contact us. Our Thin Wall Attachment reduces deformation and will typically produce better bends at minimum listed wall thicknesses. Hydraulics systems – We offer 2 hydraulics systems for our machine. The air/hydraulic system covers the entire chart above. The electric/hydraulic system maxes out at 1.5 x .156 wall square tube or 1.75 x .188 round tube, or 2.00 x .120 round tube. This is because the power of the electric/hydraulic system is biased more toward speed than outright tonnage. Have questions not covered in ANY of our tech articles or FAQ?! E mail us or call. We will answer them and publish the popular ones.